There are several different technologies that can be used to deliver desktops to users. Citrix and VMware each make products that only support a subset of the different options. 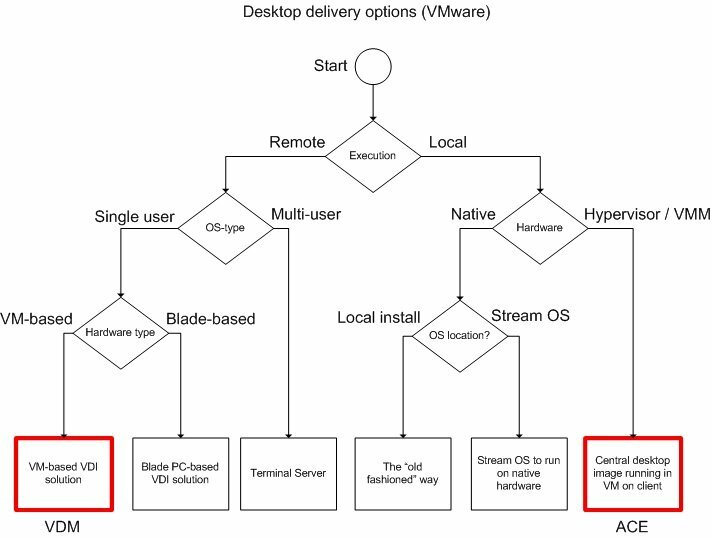 If single user, VM-based or blade-based? If local, running natively or virtualized? If local, streamed, or installed the old way? 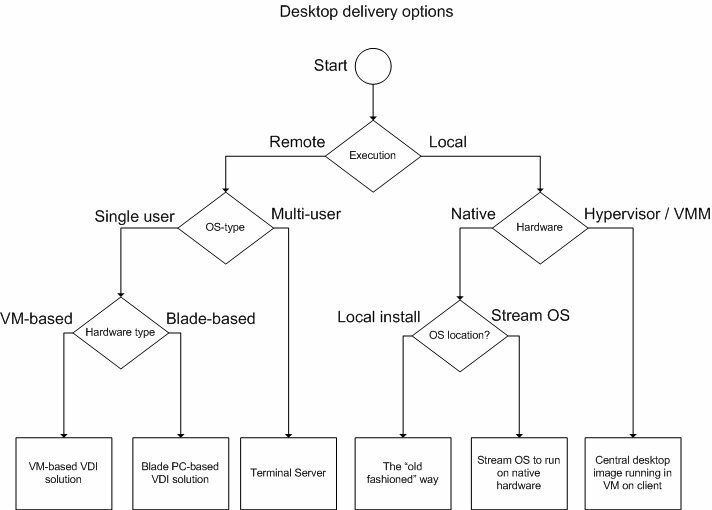 This flowchart drives towards the six boxes across the bottom representing six different technical methods, each of which ends up with a user using their desktop. Any architect knows that different technologies are right for different use cases. But as of May 2008, there is no one vendor who has a solution that can work in all six ways. Ordinarily that wouldn't be a problem. But if a vendor becomes dogmatic about it, take a seat and enjoy a good show. "Yeah, yeah.. remote is the way to go.. for sure! Uh-huh.. yep, that's right, single-user OSes do have certain advantages over Terminal Server.. good.. what's that? A blade? WHOA! STOP RIGHT THERE FOOL! Let me re-educate you as to why the one version of doing things that is the version we sell is better than the other way of doing things." "You want remote desktops? Sure, we can do remote. Single user or multi-user? Sure.. no prob at all. Single user is $75-275 per user. Oh, you don't like the user density of single-user hosts and you think that is too expensive? No problem, we can go Terminal Server to get you that savings you need.. Yeah, we offer it.. it's only 3x more expensive for our licensing, but yeah.. think of the power and cooling costs you're saving! So it's your call. Oh, you want both? No problem, let me just pull out my calculator.. we charge separately for these you know.. gotta keep that revenue up.. you know how it is.. so let's see... that's $425-$875 per user. And you have all your Microsoft CALs and your profile management solution already in place, right?" And for the really adventurous customers, the Citrix sales rep continues, "You want to stream the local OS to the local desktop? 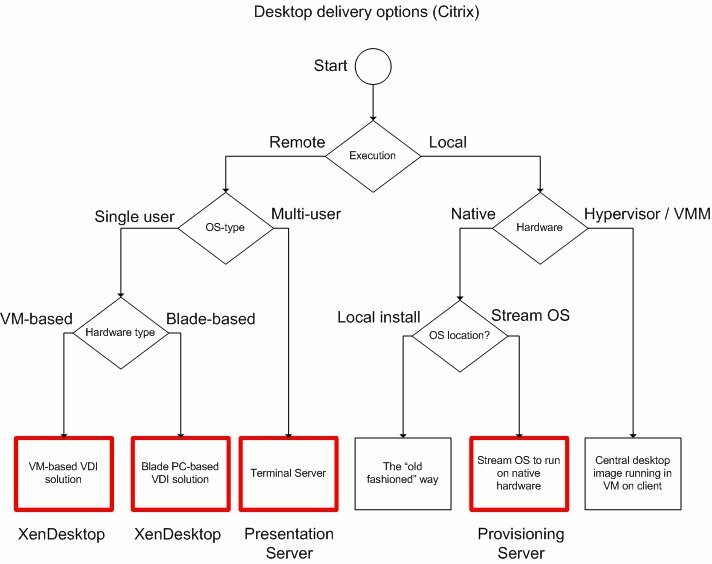 No, no, XenDesktop doesn't do that.. Yeah, I know "desktop" is in the name, but XenDesktop is just for remote desktops... Why do you want local again? We don't really have anything... we're more of a remote... oh, you say it's on our website? Hmm.. ok, yeah, so another $250 on top of everything so far and you're set. But hey, did I tell you the hypervisor is free? I mean FREE free. Let's see VMware compete with that, eh?" Imagine if this was the auto industry. We consumers just want to be able to buy cars and trucks that meet our needs. VMware only makes pickup trucks, which to them is fine, because you're obviously a dumbass if you can't understand why everyone needs a pickup truck. Citrix makes both cars and trucks--trucks like VMware for hauling stuff, and cars for hauling people. So you think you're covered! The only problem is Citrix doesn't put any seats in their trucks because hey, trucks are for hauling stuff, not people. If you want to haul people, then buy a car (which they also happen to make). What about customers who want to haul people and haul stuff? They should buy a car and a truck. And what if you want to haul people and stuff at the same time? No problem. You can put the car in the back of your truck. And then Quest is over there on the side quietly making exactly what people want, but no one notices. And Ericom is over there on the side too, reminding everyone every fifteen seconds that they're there, but no one cares. I'm one with 4000 concurrent sessions being deployed now mixed across VDI and TS, and I love it, especially their new SpeedScreen stuff - they should call it ScreamSpeed. What's Quest's pricing like compared to Citrix/VMware, particularly if one only wants a solution similar to Citrix Presentation Server and not streaming/remote desktops etc.?? I believe it's $100 retail for the Enterprise licence. Retail be the operative word. You may want to wait until after iForum before claiming that XenDesktop, XenApp, and a profile management solution will be three different MSRP costs to the customer to do all three. Are you thinking what I'm thinking? Or should that be "Do you already know what I'm thinking?" Let me guess, Citrix finally release an edition that covers everything they do (no doubt called Citrix Diamond Edition or something equally amusing) and then buy RES or AppSense and include that too? The enterprise edition of VAS is $99 per CCU. That's the whole ball of wax seamless apps on TS, VMs or blades, Universal Print Driver (a true one), profile management, RDP extensions and more. And there's a Desktop Services edition that does not include terminal services support at $50 per CCU. Too late to the game, buddy boy! oh, and I forgot to mention our migration option, $50 per CCU to migrate from an existing implementation of Citrix, or other TS product, called VAS Enterprise Edition - platform migration. No ICA = not worth it. The costs don't seem to add up. Requirements can be met with other older and simpler technologies. It may be "cool" but I just don't see it. Gimme Pres Server/thin clients and leave me alone ! oh... I'm sorry, but it's very "worth it"
I have been examinating out some of your stories and i can state pretty nice stuff. I will surely bookmark your <a href="gadgetterbaru.web.id/.../a> blog. It has been a good resource of information for me in my research. Thank you so much admin.